February 11th, 2016. In today's Tokuban Adventure livestream, hosts Yoshida Hitomi and Enoki Junya showed a gameplay clip from the upcoming Digimon World -next 0rder-, featuring female protagonist Shiki with Tailmon and the DLC Maicoomon as her Digimon partners. Maicoomon was previously revealed to be downloadable content for the game last November. 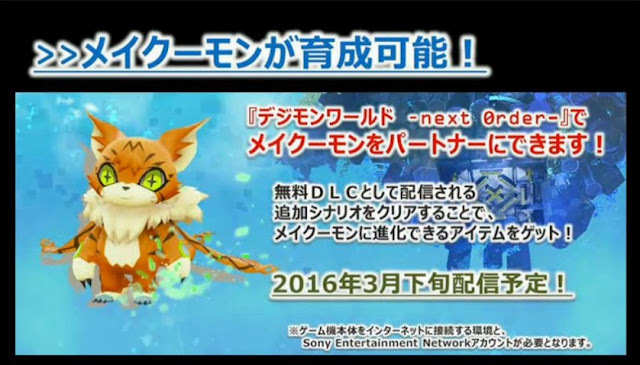 In the stream it was specified that Maicoomon can be obtained as free DLC; Digimon tamers will receive her evolution item after completing an additional scenario, which can then be used to evolve one of their two Digimon partners into Maicoomon.